Going Commando | A SWTOR Fan Blog: Are Galactic Command Boosts on the Cartel Market One Step Too Far? Are Galactic Command Boosts on the Cartel Market One Step Too Far? Let me preface this by saying that I hate discussions about pay-to-win in MMOs, simply because I have yet to see any such discussion go anywhere interesting or useful. Since MMOs don't have a clear and indisputable win condition, whatever area you personally don't want to see people overtake you in is at risk of any related cash shop purchases being perceived as pay-to-win. I'll never forget Liore's post about how cash shops selling all those cosmetics kind of sucked the fun out of MMOs for her since collecting cool outfits had been an important part of her gameplay until then. But even when we're talking about an aspect of the game that is clearly meant to be competitive and where most people would agree that they don't want money to buy someone an advantage, players are easily distracted by simple obfuscating tactics. People protesting about the Sword of a Thousand Truths being sold in the cash shop? Well, make it so that by collecting a thousand rare "sword shards" in game, people can acquire it without paying as well. Never mind that it's going to take three years and nobody is realistically going to do it, a lot of people will suddenly give it a pass if there's a way of getting the same thing without paying, never mind that it's not really viable in practice. The only thing that I see all pay-to-win accusations having in common is that the cash shop items in question make people uncomfortable. To be fair, that also applies to things that don't necessarily have anything to do with pay-to-win, such as lockboxes, but let's use it as our standard anyway. Galactic Command boosters definitely make me uncomfortable. To explain why, let me first talk a bit about what I tend call my secondary MMO: Neverwinter Online. There are definitely things I really love about that game or I wouldn't be playing it, but its cash shop is not one of them. I do want to give Cryptic money every now and then because it only seems fair when I've spent a significant number of hours playing their game... but deciding what I actually don't mind spending money on is always an agonising experience. Or take refinement, a related process through which you upgrade your gear in Neverwinter. For this you need to use up "refinement points", which again you do get through normal play, quite commonly in fact, but you need literally millions of them to actually fully upgrade an item, which is never going to happen for most people by playing normally - but once again, the cash shop offers relief in the form of expensive items that are worth tens of thousands of refinement points at once. The reason these things bug me is that they are basically a sneaky way of trying to get a continuous stream of money out of players. I'm actually someone who is quite happy to continually support a game financially (aka pay a sub)... but be honest about it! Don't make your game free and then make it such a pain to progress that you have to shell out money over and over again (unless you're willing to literally just pay hundreds of dollars at once to get your items to cap right away). What does all this have to do with SWTOR? Well, SWTOR does charge a subscription. But now we have a new, super grindy system for subscribers anyway, and lo and behold, there's also something you can spend money on to ease the pain for a little while, again and again. Not subtle, Bioware. The main mitigating factor in my eyes is that it's really a pretty weak boost. 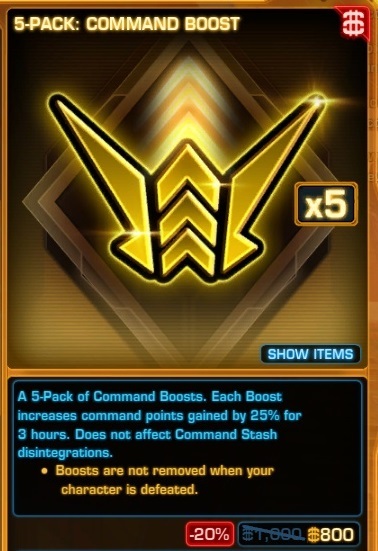 25% extra CXP doesn't really speed you up significantly in the short term, and you still need to actually play too - the boost increases your Galactic Command gains but doesn't just "give" points to you. But it still feels like a pretty cheap move, and I think Bioware can do better than that. If Command XP were a thing for everyone and then subscribers got a boost to it automatically, fine. But paying to be able to grind and then paying again to lessen the grind is a poor way to be treated as a customer. All that said, I will confess that I actually bought some of these boosts. Why? Because thanks to referrals, I'm sitting on tens of thousands of unused complimentary Cartel Coins that I never use for anything since I'm not really one to buy lots of cosmetics or crates of randomness. There's just little for me to spend them on right now, and at least these boosts are actually useful to me. I don't know how I'd feel if I actually had to pay for them with real money though. I don't think I would want to. I think we instinctively realize that the problem with anti-grind consumables is one of incentives. If the company sells anti-grind consumables, they now have an incentive to make the grind excessive in order to drive sales. If the company sells hats, well, that's incentive to make more and different hats. There's no incentive to monkey around with gameplay. I think this wouldn't have been an issue at all if they had waited a couple months before introducing them. It would have given everyone a chance to experience the grind and frustration of hitting max CP level the hard way. Then they would have put these out and anyone who had an alt grinding up Command would have been excited. Rolling it out this early seems a bit of a nickel and dime routine. Can't agree more with Rohan. The problem with these type of items is that they can legitimise grind. They were indeed not planned, so 'complot theories' are not in order, but (as Shintar said) that doesn't change what it does. Very interesting. I tried Neverwinter ~2 years ago and it was the P2W items in EndGame from the cash shop that put me off the game. Agreed on the CXP Boosts too! Because Galactic Command already requires a sub, I'm disappointed that they are also employing cash shop shenanigans. I have more understanding of you doing F2P things in your game if you're truly F2P. SWTOR has a box cost and a subscription required if you want to gamble with Galactic Command. Just another reason that Galactic Command doesn't really exist for me. It's when people who don't need to use them buy them purely as a luxury item that I begin to have a problem. Sure, 25% is relatively harmless but you just know that somewhere out there players with CR 60/70+ on their main character already are taking full advantage of this. Unfortunately, because you can't inspect a character's Command Rank you can't tell which players are in which situation, so it's very easy for someone to judge people the wrong way simply by seeing the Boost on their buff bar. I would feel a lot better about these GXP boosts if they are also granted outside the shop, for instance by completing or certain weekly or something, or for hitting L70. After all, you get the 'normal' XP boosts as well for completing class stories. I'm not sure that would really make me feel better to be honest. Like the "Sword shards of a Thousand Truths" example it would likely only be a symbolic drop in the bucket. I would have been a lot happier about this if the existing XP boosts also worked on CXP. They sold (still sell? I haven't checked) XP boosts in the CM, and the CXP bar actually takes the place of your normal XP bar once you hit level cap. The tropes of pure F2P games don't bother me (or I wouldn't play as many as I do, nor throw money at them from time to time). I'm sort of more in favor of an a la carte menu for gameplay (F2P model with costs in premium currency for non-basic gameplay access) than the "price-fixe" subscription model. The game I think hit the sweet spot of this was Puzzle Pirates (though I gafiated from it years ago because the actual mechanical gameplay was not my cuppa and the people I was playing with drifted out of the game, leaving me no good reason to log in). OTOH, there was no real Pay To Avoid grind involved (that I recall), it was just that benefits of subscribing (in their sub revenue model) were parceled out for microtransaction coin rather than bundled in one monolithic subscription; as though their revenue stream was entirely Passes and Unlocks in the SWTOR terminology. OTOH, they coupled this with an "auction house" where the microtransaction coin (CC-equivalent) could be traded for in-game currency (credit-equivalent), at a player-driven "market cost." There was a in-game mechanic that caused there to be a "par" cost around which the exchange rate fluctuated (you needed to pay a certain amount of CC-equivalents to make credit-equivalents "passively," the rate of which could be used to derive the "value" of a CC vs a Credit). The CXP boosts being over twice the cost is why they didn't carry over the standard XP boosts, I guess. And, makes the CXP boosts that much more of a luxury item. Honestly, as someone who has been on both ends of the "more time than money, more money than time" see-saw, I don't mind seeing a way to convert money into time for sale.